METALITALIA.COM FEST 2018: ELDRITCH forced to cancel, WHITE SKULL step in! Metalitalia.com, Eagle Booking Live Promotion and Vertigo regret to inform our patrons that ELDRITCH have been forced to cancel their participation in the festival due to some last minute personal circumstances. The band apologises to their fans and hope to play Metalitalia.com Festival in the near future. Don't despair though, as the festival team has promptly found a great replacement! In fact ELDRITCH's slot on Saturday, September 15th will be taken by local power metal heroes WHITE SKULL, who will celebrate their 30th anniversary as a band with a very special set solely based on their most ambitious and popular albums, "Tales From The North" and "Public Glory, Secret Agony"! Please see WHITE SKULL's message and invitation HERE. Metalitalia.com Festival continues to strive forward bringing the biggest bands in the world to the Live Club in Trezzo sull'Adda (Milan) while giving emerging bands the chance to support such bands and progress forward keeping the scene thriving! Live Music Club with its advanced technical equipment is one of the most important and renowned venues in Europe for indoor events. Awarded in 2012 as the best Italian music club, the location offers also free parkings, connections with the Milan’s public transports and a big outdoor area where you’ll find stalls, merchandise, CDs, meet & greet, lounge, food and bar. Moreover, at the first floor the Live Club Restaurant with its 100 seats is the best place to eat with an exclusive view of the stage. 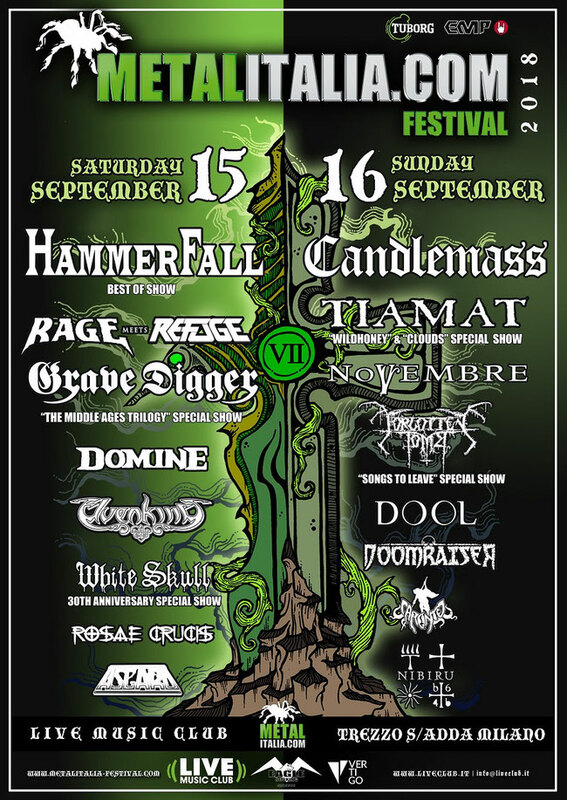 tagPlaceholderTag: epic metal, Black Metal, Vertigo, doom, classic/power metal, Eagle Booking Live Promotion, METALITALIA.COM FEST 2018, : ELDRITCH, WHITE SKULL, "Tales From The North", "Public Glory, Secret Agony"